Also includes the Trial-Use "Expansive Language" liturgies from GC2018 B078. 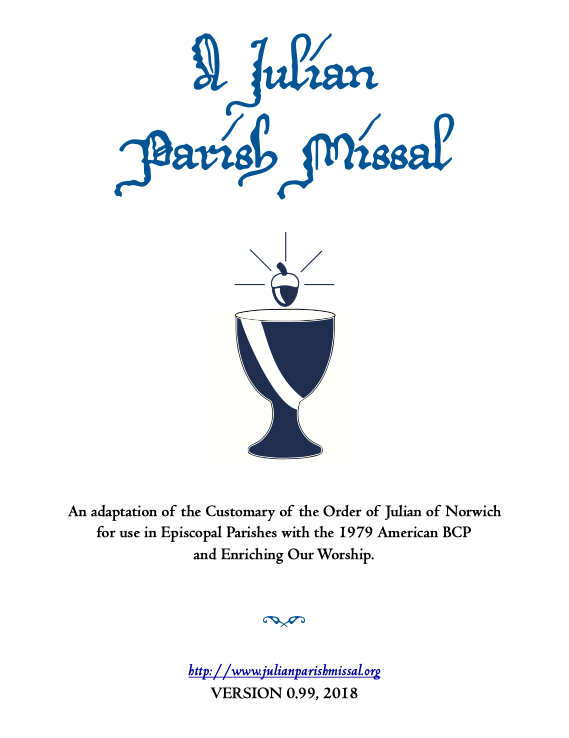 A Julian Parish Missal takes the ceremonial (Manual Acts) of the customary of the Order of Julian of Norwich and presents them along with Prefaces and the Eucharistic Canons of Rite I and Rite II of the 1979 American Book of Common Prayer and Enriching Our Worship. Appendixes contain parts of the OJN "Book of the Chair" and the Trial-Use liturgies from GC2018 B078. ​In addition, the Propers of the Sunday Cycle provide pointed versions of the Collect of the Day, suggested collects after the Prayers of the People, and suggested topical Offertory Sentences. It is presented as a free, downloadable PDF. This publication is the personal project of the Rev. David Simmons, ObJN and is not an official publication of the Order of Julian of Norwich. No rights of any kind are claimed.